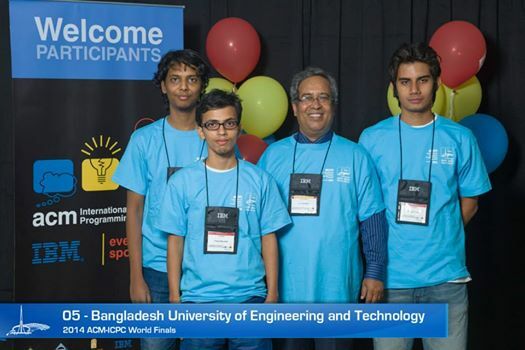 BUET secured 19th place in the 38th Annual World Finals of the ACM International Collegiate Programming Contest (ICPC). The team from BUET solved 3 programming problems to beat top universities like Carnegie Mellon University, Stanford University, University of California at Berkeley and were ranked same as Massachusetts Institute of Technology (MIT). The event, sponsored by IBM, was hosted by Ural Federal University on 25 June 2014 in Ekaterinburg, Russia. ACM-ICPC is the premiere global programming competition conducted by and for the world’s universities. For nearly four decades, the ICPC has grown to be a game changing global competitive educational program that has raised aspirations and performance of generations of the world’s problem solvers in the computing sciences and engineering. In this battle of brains, teams need to demonstrate excellence in algorithms, programming, and teamwork strategy. Teams of three students represent their universities in multiple levels of regional competition. Top teams from regional competition in different regions advance to the final round. This year’s regional competitions advanced 122 teams to the World Championship round. BUET advanced from the Dhaka regional site. The team comprised of 3 students - Pratyai Mazumder, Mohammad Hafiz Uddin and Prasanjit Barua LinKin. Pratyai recently graduated from the EEE Department, while Hafiz and Prasanjit are about to graduate from the CSE Department. Mohammad Saifur Rahman (Lecturer, Dept. of CSE) was the team coach, while Professor Dr. M Kaykobad (CSE) was the on-site coach. The Department of CSE provided patronage for the team in preparation, while BUET CSE Alumni Association sponsored the travel and misc. expenses.